The 1990s opened as the state of Minnesota and the Metropolitan Airports Commission (MAC) began deciding the future of Minneapolis-St. Paul International Airport: whether to expand at its existing location or develop a new airport elsewhere. As that work began, Northwest Airlines sought public financing to expand its presence in Minnesota –financing that later proved important in helping the airline survive a period of financial losses. Pictured: Samuel Skinner, US Secretary of Transportation, and Jeff Hamiel, CEO and executive director of the MAC, meet in the early 1990s. Following the purchase of Northwest Airlines in 1989 by Wings Holding, the airline was carrying debt that limited its operations. Northwest lost money in 1990 and 1991, leading up to its request to the MAC and the state of Minnesota for assistance to build Airbus maintenance bases in Duluth and Hibbing, Minn.
Over the course of almost a full year, Northwest and the state negotiated a deal; the incentives package was re-worked several times. At one point a handful of cities and airports around the U.S. were bidding for the planned Airbus maintenance base. Interested parties included Kansas City, Detroit, Memphis, Seattle, Indianapolis and Milwaukee. Ultimately, the state of Minnesota approved a $761 million financial assistance package for the airline to reduce debt and build facilities in Northeastern Minnesota, a deal that crafted a unique partnership between the airline and the state. The financial package provided some stability for Northwest, but a recession in 1991 and competition among airlines put further pressure on the industry. By 1993, Northwest was floating the idea of bankruptcy due to its continuing debt burden. Ultimately, Northwest employees made wage and other concessions, and lenders renegotiated loans, giving the airline better financial footing. Northwest’s financial position improved in the mid-1990s, and the airline added flights to six Canadian cities, improved its frequent flier program and expanded electronic ticketing as online booking became popular. Northwest’s fleet grew to more than 400 planes and a partnership with KLM Royal Dutch Airlines increased Northwest’s presence globally. Northwest’s new $46 million Airbus A320 maintenance base opened at the Duluth International Airport in 1996; Airbus maintenance operations ceased there in 2006. Also in 1996, a Northwest reservation center opened in Chisholm, Minn. Delta still operates that facility as its Iron Range Customer Engagement Center. Other Northwest-related events had occurred over that same stretch of time that bode well for MSP. In April 1991, a KLM 747 touched down at MSP. Although international charter operations had previously served the Twin Cities market, the KLM flight marked the first scheduled service by an overseas-based air carrier to MSP. KLM was a minority partner of Northwest Airlines at the time. The flight from Amsterdam, the Netherlands was greeted by Northwest Airlines’ Co-Chairman Al Checchi, former Vice President Walter Mondale, U.S. Rep. James Oberstar and Gov. Arne Carlson. 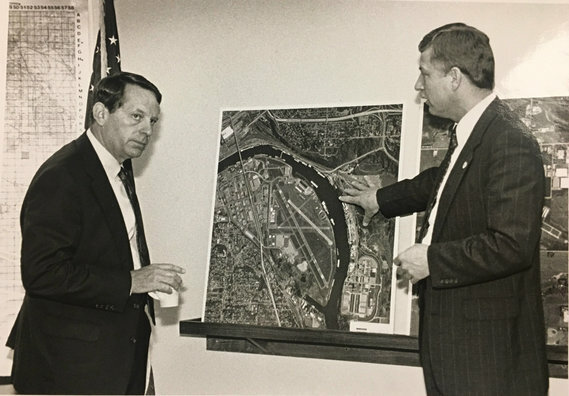 Other important events early in the 1990s included the Minnesota Court of Appeals unanimously upholding a decision that had been made by a Hennepin County jury in a test case over airport noise. The jury had found that the MAC didn’t directly or substantially violate the rights of three homeowners who lived near MSP. The lawsuit had initially been filed as a class-action lawsuit by more than 27,000 business and residential property owners. To expedite a decision, the courts had ordered the test case. At the same time, the MAC was advancing plans to provide noise-insulating measures for eligible homeowners near the airport. The MAC had started insulating schools near the airport in 1981, when it provided window replacement, air conditioning and other improvements at St. Kevin’s school on 28th Avenue in Minneapolis. Eighteen other schools near the airport would receive insulation by 2006. In 1992 the MAC and the Federal Aviation Administration announced an initial sound-insulation program for 300 homes. The work consisted of improvements that could include window reconditioning or replacement, new doors, wall and attic insulation, baffling of roof and attic vents and central air conditioning. The program placed MSP among the most responsive airports in the country on noise mitigation efforts. Since 1992, the MAC has spent more than $484 million on noise mitigation. At MSP, work was also underway in 1995 to reconstruct and extend the length of Runway 4-22, which runs diagonally from the southwest to the northeast, to improve the safety and capacity of that airstrip. In 1989 the MAC began the dual track study at the direction of the State Legislature. Lawmakers wanted to determine if MSP should be expanded at its current location or if a new airport should be built in southeastern Dakota County, near Rosemount. The study resulted from pressure by opponents of aircraft noise in the neighborhoods near the airport and MSP’s growth projections showing the airport could outgrow its existing site. Over the course of seven years, the MAC and consultants ran various models of passenger demand and airfield configurations to gauge the feasibility of an additional runway at MSP. Meanwhile, analysts calculated the cost of building a new airport, an idea that met increased resistance from Dakota County residents and politicians. Later in the evaluation process, the idea of remote runways and a small terminal south of Rosemount -- connected to MSP by high-speed rail -- was also briefly considered. State lawmakers aimed to choose between an expansion of MSP or a new airport by 1996. The dual track study came to a head that year as the MAC board voted 11-3 to recommend the expansion of the existing airport instead of moving to a new location. Northwest Airlines and the downtown Minneapolis business community had been opposed to relocating MSP International to the edge of the southern suburbs. The dual track study had shown that expanding MSP with a fourth runway, more gates and a new terminal could handle all of the growth forecast through 2020. The study also found that the expansion would deliver the same economic benefits of a new airport, but for $2.2 billion less. The MAC’s vote sent the issue to the State Legislature, which had the final say on the issue. Legislators later that year approved the expansion plan for MSP. The result: the $3.1 billion MSP -- Building a Better Airport expansion program. The MAC had analyzed three proposals for new runways at MSP. The plan chosen involved the construction of a new north-south runway, which today is runway 17/35, running mostly parallel to Cedar Avenue on the west side of MSP’s airfield. In addition to the runway, other expansion projects at MSP included 42 new gates at Terminal 1, a new Humphrey Charter Terminal, new parking ramps and plans for the addition of light-rail transit at both terminals. Sources: MAC archive material, Minneapolis Star Tribune, Minnesota Historical Society archives. These articles are listed in chronological order. We invite you read them all.